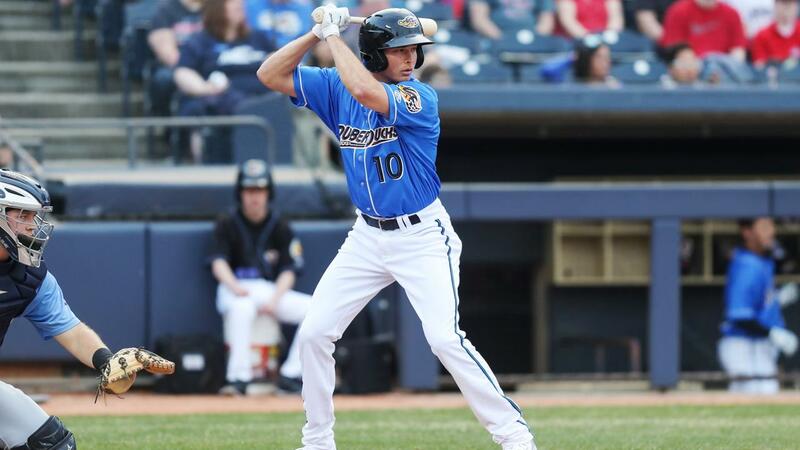 Akron's Zach Plesac tossed six strong innings, and Tyler Krieger drove in a pair of runs with a two-hit night, as the RubberDucks edged the Erie SeaWolves, 6-4, Saturday night at UPMC Park in Erie, Pa. The RubberDucks (77-61) scratched out a pair of insurance runs in the eighth inning against Matt Ecker to claim a 6-2 lead. Those tallies ended up being the crucial runs of the game. Akron loaded the bases with no outs, and Ecker walked Mark Mathias with the bases loaded to force in a run. After Ecker was lifted in favor of lefty Caleb Thielbar, Daniel Salters lined an RBI single to left to drive in a run to make it a four-run game, 6-2. Plesac (3-1) was recalled from Single-A Lynchburg on Saturday and picked up his first Akron win since May 29th. The 23-year-old right-hander worked six innings and gave up just two runs on six hits. He walked only two and struck out seven. He surrendered an RBI single to Will Maddox in the third and a solo homer to Josh Lester in the fourth. The SeaWolves (62-76) rallied in the eighth against Preston Claiborne and Rob Kaminsky. Claiborne left with a man on and one out, and the Wolves came up with two hits and a walk against Kaminsky to scratch out two runs and pull within 6-4, but the lefty managed to get Kody Eaves to ground out to strand two runners on base. In the 9th, Kaminsky gave up a hit and a walk and was facing Lester with two outs, but fanned the Erie slugger to end the game. Krieger lined an RBI single in the first inning off A.J. Ladwig (4-2). He added a sacrifice fly in the third to give the Ducks an early 2-0 lead…Salters had a three-hit night plus a sacrifice fly…Ernie Clement was 2-5, with a triple…Nellie Rodriguez stroked an RBI double in the sixth. He has a pair of extra-base hits in the series…Akron has won both games against the Wolves…The win keeps Akron's division title hopes alive, although Altoona won at Bowie to lower their magic number for clinching the EL West title to one with two games to play…Time of game: 2:50…Attendance: 4,668. The RubberDucks and SeaWolves will continue the series on Sunday evening at 6:05. The game will be broadcast on Fox Sports 1350 AM, the WARF iHeart channel, and the TuneIn Radio App.